The cultural and political differences besetting Ukraine are the product of very different patterns of regional settlement. Among these, the settlement of eastern and southern Ukraine stands out, for in these traditionally Russophone regions, political conflict has arisen whenever the legitimacy of Russian culture in Ukraine has been challenged. After the destruction of Kiev by Batu Khan in 1240, the land ‘beyond the rapids’ [za porog] of the Dnieper River became a no man’s land disputed by the Kingdom of Muscovy, the Tatar Khanate, and the Polish-Lithuanian Kingdom. 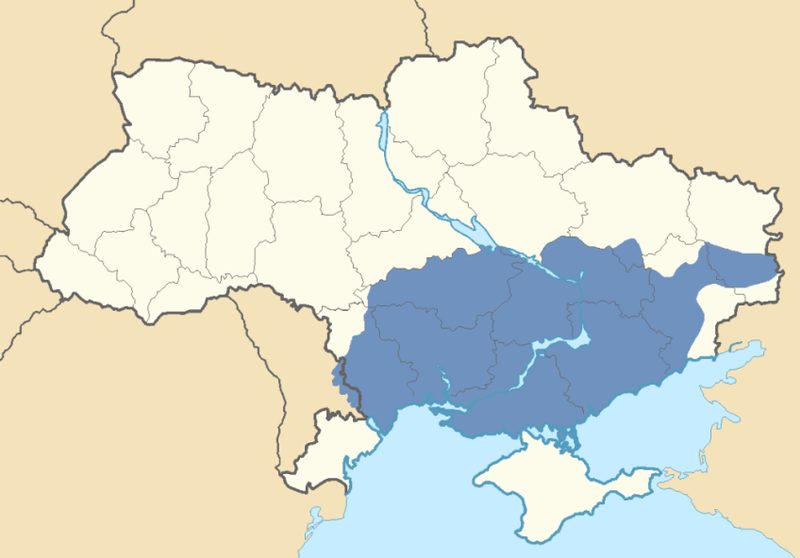 It is in this region (shown in Figure 1 in yellow) that the political life of the Ukrainian people begins, as the settlers known to history as Cossacks sought to preserve their independence, while defending their traditional Orthodox Christian faith. One of the earliest distinctions that arose among them is the geographic distinction between those who settled west of the Dnieper River, known as the Right Bank as the river flows, and those who settled east of the river, known as the Left Bank. 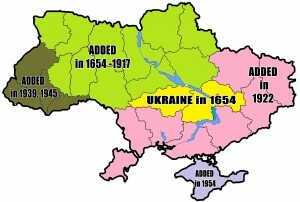 Figure 1: Simplified historical map of Ukrainian borders: 1654-2014. The Left Bank, which includes the current regions of Crimea, Dnipropetrovsk, Donetsk, Kharkov, Kherson, Lugansk, Odessa, Nikolayevsk, and Zaporozhye, forms a relatively compact ethnic and cultural community that is distinguished by the strong influence of Russian culture, even where the majority of the population defines itself as Ukrainian. 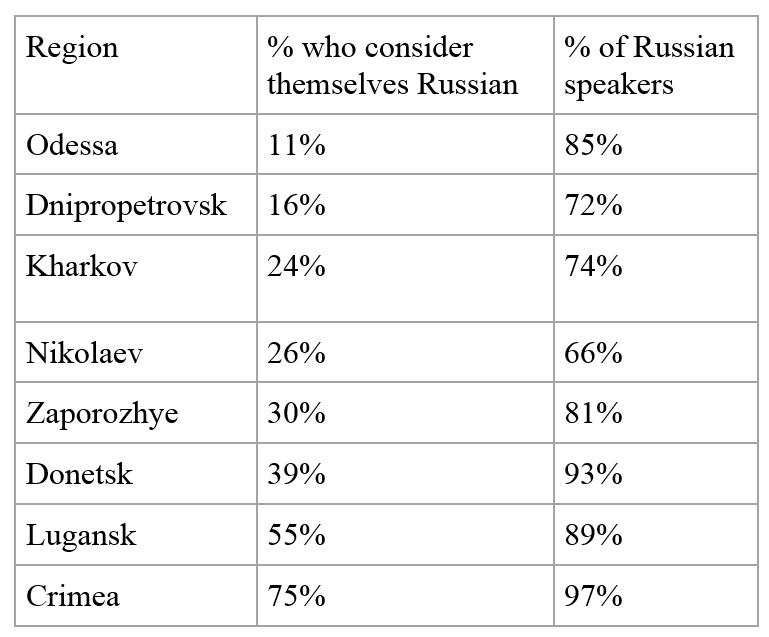 In the eastern regions that supported Viktor Yanukovych in the 2004 elections, for example, the percentage of the population that considered itself ‘Russian’ was only 34.5 percent, but the percentage of those who considered themselves to be primarily ‘Russian speakers’ was 82.1 percent (see Table 1). Table 1. Percentage of Russians and Russian speakers in regions that supported V. Yanukovych. The reasons for this heritage can be traced to the four distinct waves of Russian settlement east of the Dnieper River: Slobodskaya Ukraina, Novorossiya, Crimea, and Donbass. Slobodskaya Ukraina or slobozhanshchina, includes not only the Ukrainian regions of Kharkov and Sumy, but also the regions of Voronezh, Kursk and Belgorod, which are currently part of the Russian Federation. The name derives from the sloboda, or fort settlements, that the Cossacks established on the left bank of the Dnieper. These were granted considerable local autonomy in exchange for service defending the borders of the Russian Empire. They also benefited from certain tax exemptions and trading privileges. Although their ‘free’ status ended in 1765, when Catherine the Great made the Cossacks into regular soldiers, many of these sloboda prospered and later developed into major Ukrainian cities. Kharkov, Ukraine’s second largest city and the capital of the Ukrainian SSR from 1919 to 1934, was the administrative and cultural capital of slobozhanshchina. Its university, the second oldest in the Russian Empire, made it a major Russian cultural centre, as well as a prominent centre for the study of the Ukrainian language. 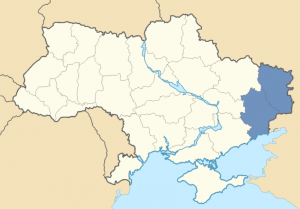 Novorossiya, a name that gained recent notoriety after it was used by Russian president Putin in April 2014, is actually the historical name of one of the youngest and most ethnically diverse regions of Ukraine. Incorporated into the Russian Empire as a result of the Russo-Turkish wars of the 18th century, the settlement of this region followed a similar pattern of establishing military forts that eventually became cities, essentially an extension southward of Slobodskaya Ukraina. Since the conquest of Novorossiya added a new coastline to the Russian Empire, however, specific incentives were added to establish new ports and promote trade there. This is how Odessa, now Ukraine’s third largest city, became the region’s cultural and commercial centre. Its early status as a free port, along with the appointment of foreign administrators, contributed to an aura of cosmopolitanism that attracted large numbers of Jews, Greeks, Armenians, and Italians. By the end of the nineteenth century, it was referred to colloquially as the ‘Southern Capital of the Russian Empire’. Further inland from the coast, Russian rulers encouraged the settlement of Serbians, Bulgarians and Hungarians. Indeed, before the 1917 Revolution, Novorossiya’s two largest administrative districts were known as New Serbia and Slavo-Serbia (ru.wikipedia.org, 2014a). Perceived as a region sympathetic to the Whites during the Russian Civil War, the use of the term Novorossiya was suppressed in Soviet times. Crimea, or Tauridia, is among the oldest recorded settlements along the Black Sea coast. Archaeological records reveal Greek colonies there as far back as the ninth century B.C. Later, the peninsula fell under Scythian, Gothic, and even Genovese control, until it was captured by Ottoman forces in 1475. It was finally taken by Russia in 1783. Crimea was transferred administratively from the Russian Soviet Federated Socialist Republic (RSFSR) to the Ukrainian Soviet Socialist Republic (SSR) only in 1954, and is the only region of Ukraine whose population identifies itself as predominantly ethnic Russian. Along with the status of the indigenous Crimean Tatars, this has been a sore spot throughout the post-Soviet era. Given recent events there, it is worth summarising Crimea’s tense history in independent Ukraine. In January 1991, as the USSR disintegrated, the Crimean regional government decided to hold a referendum to ‘restore’ Crimean autonomy, abrogated in 1946, and have Crimea recognised as an independent participant of the new Union Treaty being proposed by Mikhail Gorbachev. This opened the door to separating Crimea from the USSR, of which Ukraine was then still a part. Nearly 84% of registered voters participated, and over 93% voted for autonomy (ru.wikipedia.org, 2014b). 12 February 1991 – the parliament of Soviet Ukraine acknowledged this referendum, and in June amended the Ukrainian SSR constitution. 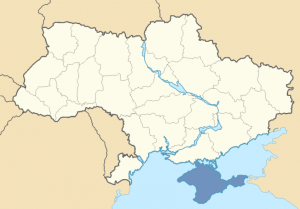 On 4 September 1991, the Supreme Soviet of the Autonomous Crimean Republic (ACR) proclaimed its sovereignty and declared its intent to create its own democratic state within Ukraine. On 1 December 1991, Crimean residents took part in the Ukrainian independence referendum and 54% voted for Ukraine’s independence from the USSR – the lowest percentage of any region in Ukraine. On 5 May 1992, the Supreme Soviet of the ACR adopted an ‘Act Proclaiming the State Sovereignty of the Crimean Republic.’ Under pressure from Kiev, it was revoked the next day, but the region nevertheless adopted a Crimean constitution that conflicted with the acting Ukrainian constitution in several key points. Meanwhile, the Russian parliament voted to rescind the 1954 decision transferring Crimea from the jurisdiction of the Russian SFSR to the Ukrainian SSR. Over the course of the next several years, relations between the Crimean and Ukrainian governments remained tense. The situation, however, seemed to be resolved when Russia did not respond to Ukraine’s decision in March 1995 unilaterally to revoke the 1992 Crimean constitution. Nevertheless, the situation reignited in early 2014 when street demonstrations in Kiev turned violent (newsru.com, 2014a). The day after President Yanukovych was removed from office, three thousand regional officials from eastern and southern Ukraine gathered in Kharkov, and voted to assume political control in their regions until ‘constitutional order’ was restored in Kiev. In Crimea, the regional parliament, one of the instigators of this meeting, went even further. It called for a referendum on Crimean autonomy within Ukraine (Rada.crimea.ua, 2014). Kiev responded by putting the Ukrainian military under the direct command of then acting speaker/president Oleksandr Turchynov, who then tried to replace local military commanders and security forces in Crimea. The Crimean authorities then appealed to the resident Russian Black Sea Fleet for assistance in ‘maintaining security.’ On 1 March, citing the threat to Russian citizens, military personnel and compatriots in Crimea, Russian president Putin asked for and received authority to use Russian troops in Ukraine. A week later the Crimean referendum was moved up and the question changed from autonomy within Ukraine to secession with the intent of joining Russia. On 16 March, secession was approved by more than 80% of the population. The Crimean leadership thus took advantage of the turmoil in Kiev to redress an old grievance – the abrogation of its 1992 Constitution. Russian intervention directly facilitated its ability to hold such referendum, which most international legal experts consider illegal. The Crimean government, however, noted that, in its advisory opinion on Kosovo’s declaration of independence, the International Court of Justice found that ‘there was no general rule – barring declarations of independence, or authorising them for that matter, that these were political acts.’ Since Russia considered holding a referendum was just such a ‘political act,’ and the legitimacy of the government in Kiev was in dispute, it contended that the Crimean government was well within its rights to act (Newsru.com, 2014b). Donbass is in many ways typical of south central Russia. 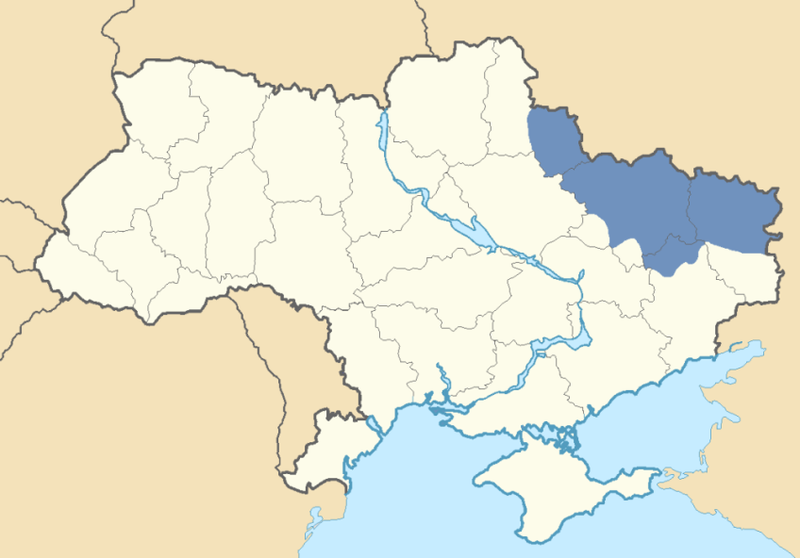 While other regions of Ukraine were settled due to territorial disputes and conquests, the growth of Donbass is linked to the discovery in 1720 of Europe’s largest coal basin, and the rise of local industry. Until quite recently, the two regions of Donetsk and Lugansk contributed nearly 16% of Ukraine’s GDP, and as much as a quarter of its industrial output (Poluneev, 2014). Another specificity of this region is its periodic uprisings, fed in part by the half million Old Believers that settled in this region during the latter half of the 17th century. The descendants of this famously independent community would later form the backbone of anarchist Nestor Makhno’s ‘Black Army’ (Gazeta.ru, 2014). At the end of the Soviet era, the political activism and initiative shown by the Donbass miners further added to the region’s rebellious image (Kmet, 2014). For Ukrainian nationalists, however, Donbass is also one of the most ‘Soviet’ and therefore ‘alien’ regions of Ukraine. Bohdan Chervak, the chairman of the Organisation of Ukrainian Nationalists, calls it ‘not Ukrainian territory by content’ (Chervak, 2014), and even former Ukrainian president Viktor Yushchenko recently referred to both Crimea and Donbasss as regions ‘where our language practically does not exist, where our memory is nonexistent, where our church is absent, where our culture is absent… utterly foreign lands [de chuzhina chuzhinoyu]’ of which, he insists, ‘not a single clump of earth’ may ever be surrendered (Ukrainska pravda, 2014). The solution most often proposed to this conundrum is to re-educate the local population into a proper appreciation of their ostensibly suppressed Ukrainian identity, a process that Donetsk University professor Elena Styazhkina euphemistically calls ‘positive, peaceful colonisation’ (Fakty.ua, 2014). These regions all rose to prominence as a direct result of the growth and expansion of the Russian Empire, and this fact has had a lasting impact on their identity. First, the historical-cultural pattern of eastern Ukraine is bicultural. This Other Ukraine has developed a self-sustaining regional identity where both Russian and Ukrainian interact freely, and are interchangeable. It is interesting to note that, whereas in the Ukrainian constitution only the Ukrainian language is considered official, in the constitution proposed for the rebellious Donetsk People’s Republic, both Russian and Ukrainian are declared official languages (Komsomolskaya pravda, 2014). Second, this territory is a border region, distinct from both Moscow and Kiev. This can be seen in the Other Ukraine’s version of Cossack mythology. While Ukrainian nationalists see the Cossacks as underscoring Ukraine’s distinctiveness from Russia, the Other Ukraine emphasises a different aspect of this myth – the Cossack defence of the Russian Empire and traditional Orthodox religion (Hillis, 2013). Finally, there is the remarkably stable voting pattern displayed by the Other Ukraine since 1994. Critics often attribute it to Soviet-era nostalgia, but it is better understood as a yearning for Soviet-era cosmopolitanism, which is more reflective of their identity. It manifests itself in the visceral rejection of the ethnic nationalism that is popular in regions of western Ukraine like Galicia, and in the affirmation of a Ukrainian identity that is inextricably linked to Russian culture, if not to Russian politics. It is therefore no surprise that the country’s political divisions have followed these historical patterns. Voting patterns in Donbass and Crimea stand out as being nearly the converse of those in Galicia (Kucheriva Fund, 2014). 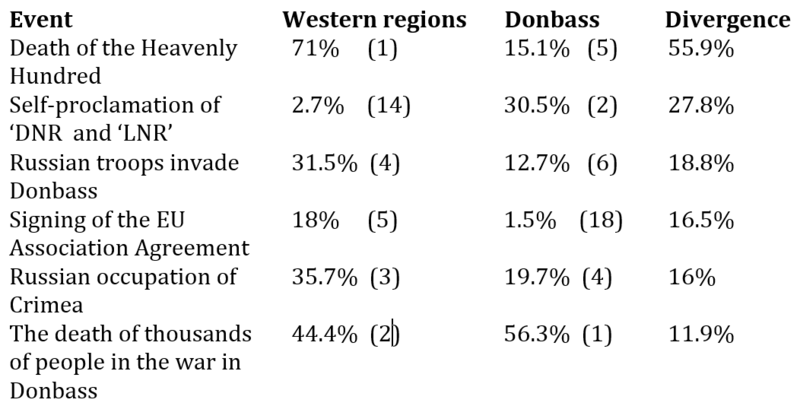 By contrast, voters in Slobozhanshchina and the inland parts of Novorossiya (Left Bank Ukraine) tend to be only marginally more pro-Russian, while the traditional areas of the Cossack hetmanate (Right Bank Ukraine) are marginally more supportive of integral Ukrainian nationalism (see Figure 2). Figure 2: Historical borders overlaid on 1994 Presidential results. These patterns re-emerged in both the 2004 and 2014 Maidan movements. 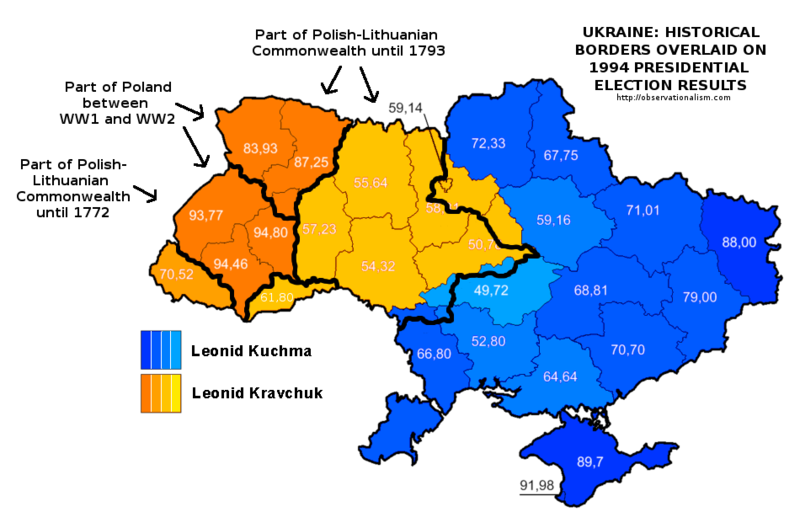 As Mark Beissinger notes, participants in the Orange Revolution of 2004 were eight times more likely to be from western Ukraine, and 92 percent claimed Ukrainian as their native language. By contrast, their opponents were overwhelmingly from the East, primarily from Donetsk, and three times more likely to speak Russian at home. ‘Quite literally,’ he concludes, ‘Orange revolutionaries and opponents of the revolution “spoke different languages” in their everyday lives’ (Beissinger, 2014). The same pattern re-emerged in 2014. Surveys of the Euromaidan in late December and early February revealed that 81 percent and 88 percent of protestors, respectively, came from outside Kiev, a largely Russian-speaking city (Tyazhlov, 2014). Given that 82 percent of the protestors communicated in Ukrainian – it is very likely that they came overwhelmingly from the western regions, where support for the protests reached 80 percent, as opposed to only 30 percent in the East and 20 percent in the South (Andreyev, 2014). While 70 percent did not support secession, in April, only 25 percent wanted to join the EU, while 47 percent preferred the Russia-led Customs Union. A follow up poll of all Ukrainian regions, conducted 12-21 September 2014 (Kucheriva Fund, 2014), confirmed the vast gulf that exists between popular attitudes in Donbass and western Ukraine. Thus, in answer to the question of whether Russia is responsible for the bloodshed and deaths of people in eastern Ukraine, only 19.1% of Donbass residents responded ‘yes’ (definitely or probably), while 62.8% said ‘no’ (definitely or probably). In western Ukraine, by contrast, 81.6% responded ‘yes’ (definitely or probably), while only 15.8% responded ‘no’ (definitely or probably). The percentage favouring separation from Ukraine has jumped dramatically, from 27.5% to 42.1%, mainly at the expense of the undecided. In sum, the military campaign has entrenched views on both sides. Western Ukrainians are now more convinced than ever that there is a Russian invasion, and that Ukraine ought to remain a unitary state, with Ukrainian as the only one official language. Eastern Ukrainians, by contrast, are now more convinced that the fault for this crisis lies in Kiev, that the Russian language ought to have equal status with Ukrainian (at least in their regions), and are now more receptive to the idea of separating from Ukraine. A follow-up survey by the Kiev International Institute of Sociology, conducted 6-17 December 2014 (Zerkalo nedeli, 2014b), confirms the pattern. EU membership continues to be seen very differently, with only a quarter of residents of the portions of Donbass under Kievan control favouring EU membership, and nearly twice as many opposing it. In the Western regions of Ukraine, by contrast, 89.3% are in favour of EU membership and only 5.7% against. In the Western regions of Ukraine, half (51.4%) have a positive view of the Ukrainian army’s volunteer combatants. This figure falls to 24.1% in the South, 19.1% in the East, and 8.2% in the portions of Donbass now under Kievan control. Another telling indication of just how deeply regional differences are ingrained is a comparison of how the main events of 2014 are perceived in Donbass and the Western regions (Lviv, Ternopil, Ivano-Frankivsk, Volyn, Roven, Khmelnitsk, Transcarpathia, and Chernovtsy). The following table shows the percentage within each district that named a given event the “most important of the passing year” (multiple answers were possible), followed by its rank within that district, and the percentage divergence between the two. The original wording used to describe the event was preserved. We see that, while there is broad agreement that casualties in Donbass and Russian occupation of Crimea are key events, there is much less consensus about the significance of Russian troops in Donbass. This is no doubt due to the considerable uncertainty inside Donbass as to the precise nature of Russian involvement there. Meanwhile, the deaths of the Heavenly Hundred, the signing of the EU association agreement, and proclamation of the Donetsk and Lugansk Peoples’ Republics are already being mythologised very differently in the different parts of Ukraine. If these historical patterns have been stable for so long, why did fighting erupt only now? Because the peremptory removal of president Yanukovych violated the delicate balance of interests forged between Galicia and Donbass. It was thus seen as a direct threat to the core interest of Russophone Ukrainians. Only after Yanukovych’s ouster do we begin to see a popular shift in the Other Ukraine from passive rejection of the Maidan, to outright rebellion in Crimea and Donbass. 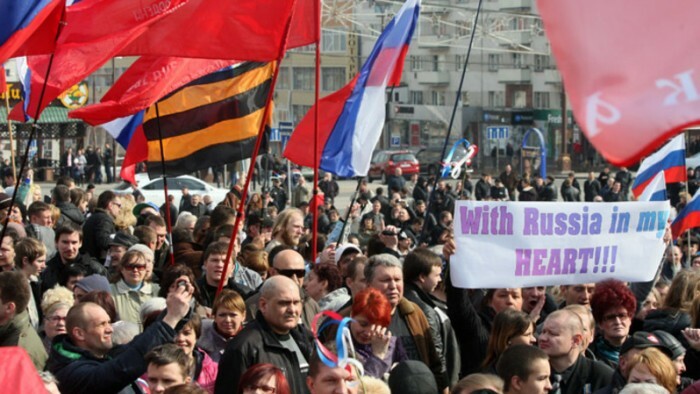 By mid-April, two-thirds of Donbass residents said they regard the Maidan as ‘an armed overthrow of the government, organised by the opposition with the assistance of the West’ (Zerkalo nedeli, 2014). Such sentiments have now been hardened by thousands of combat and civilian casualties. But, as Ukraine’s Minister of the Interior Arsen Avakov notes, war can have a salutary ‘cleansing’ effect (Avakov, 2014). There are now six million fewer Russophone Ukrainians under Ukrainian government control (not counting refugees). The previous balance of power among regions has thus been radically altered. This has encouraged some to argue that the centuries old cultural mixture that has characterised Ukraine now has a chance to be replaced by the triumph of western Ukrainian nationalism. President Putin stated in November that he will not allow ‘all political opposition’ to the current Ukrainian government to be eradicated (Govorit Moskva, 2014). Most proposals for ending the current crisis have proved to be of limited value because they tend to overlook the deep historical and cultural roots of the conflict. Both the government in Kiev and opposition leaders in Donbass are pursuing a zero-sum game, when what is needed is a mutually respectful solution. One approach that might help is that of the Copenhagen School of Security Studies, which suggests that Ukraine’s security can be enhanced by treating national identity as a shared security concern. According to the Copenhagen School, the most profound security challenge that nations face today involves not sovereignty, but identity – specifically, the identity of the cultural subgroups that make up a society and whose cohesion and loyalty are essential for society’s (and the state’s) survival. State security could thus be significantly enhanced by satisfying, rather than suppressing, the cultural demands of minorities (Petro, 2009). The fact that the Russian-speaking minority within Ukraine has a powerful external patron only makes this solution more attractive. Putin’s only two demands for Ukraine, stated in his interview of 4 March 2014, are: (1) that the population in the East and the South be safe, and (2) that they be part of the political process (Petro, 2014). By embracing the Russian language and culture as legitimate aspects of Ukrainian identity, Ukraine could thus allay Russia’s concerns, while at the same time neutralising its popular support within the Other Ukraine. This would also have the salutary effect of shifting the discourse of Ukrainian patriotism away from its current obsession with “our language” and “our identity,” toward the inclusive civic patriotism that is more common in western Europe and the United States. Acknowledging the obvious reality that Ukraine is, at its heart, bilingual and bicultural, might finally allow Ukrainians to deal with domestic issues in ways that build loyalty to the state, rather than further divide the Ukrainian nation. *Maps of Donbass, Crimea, Novorossiya and Slobodskaya Ukraina taken from http://reconsideringrussia.org/2014/05/15/historical-geography-of-ukraine/ (Accessed: 15 February 2015). Andreyev, O. (2014) ‘Power and money in Ukraine,’ Open Democracy, 12 February. Available at: https://www.opendemocracy.net/od-russia/oleksander-andreyev/power-and-money-in-ukraine (Accessed: 12 December 2014). Avakov, A. (2014) ‘V eti paru dnei mnogo govoril s nashimi. . .,’ Facebook, 22 June. Available at: https://www.facebook.com/arsen.avakov.1/posts/657281451028631 (Accessed: 25 June 2014). Beissinger, M. (2014) ‘Why We Should be Sober About the Long Term Prospects of Stable Democracy in Ukraine,’ Washington Post, 11 March. Available at: http://www.washingtonpost.com/blogs/monkey-cage/wp/2014/03/11/why-we-should-be-sober-about-the-long-term-prospects-of-stable-democracy-in-ukraine/ (Accessed: 12 December 2014). Chervak, B. (2014) ‘Stanet li Donbas Ukrainskim?’ Ukrainskaya pravda, 10 July. Available at: http://www.pravda.com.ua/rus/columns/2014/07/10/7031364/ (Accessed: 12 December 2014). Fakty.ua (2014) ‘Professor DonNU Elena Styazhkina: ‘Donbas ne vernetsya v Ukrainy potomu chto Donbas ne sushchestvuyet’,’ 6 November. Available at: http://fakty.ua/190599-elena-styazhkina-Donbas-ne-vernetsya-v-ukrainu-potomu-chto-Donbasa-ne-sucshestvuet (Accessed: 12 December 2014). Gazeta.ru (2014) ‘O teorii i istorii anarkhizma rasskazyvaet doctor nauk Aleksandr Shubin,’ 9 June. Available at: http://www.gazeta.ru/science/2014/06/09_a_6064065.shtml (Accessed:12 December 2014). Govorit Moskva (2014) ‘Mosksa ne pozvolit Kievu unichtozhit’ svoikh opponentov v Donbase, zayavil Putin,’ 15 November. Available at: http://govoritmoskva.ru/news/19114/ (Accessed: 12 December 2014). Hillis, F. (2013) Children of Rus’: Right-Bank Ukraine and the Invention of a Russian Nation. New York: Cornell University Press. Kmet, S. (2014) ‘Pravda Shaktera,’ Ukrainskaya pravda, 11 December. Available at: http://www.pravda.com.ua/rus/articles/2014/12/11/7047109/view_print/ (Accessed: 12 December 2014). Komsomolskaya pravda (2014), ‘Konstitutsiia Donetskoi respubliki: Dva yazyka, federalism i pravoslavie,’ 17 May. Available at: http://www.kp.ru/daily/26232.7/3114454/ (Accessed: 12 December 2014). Kucheriva Fund (2014) ‘Stavlennya naselennya do podii na Donbasi,’ 21 September. Available at: http://www.dif.org.ua/ua/events/stavlennjcina-miru.htm (Accessed: 12 December 2014). Newsru.com (2014a) ‘Ne menee 85% krymchan namereny uchastvovat’ v referendum,’ 11 March. Available at: http://newsru.com/world/11mar2014/opros.html (Accessed: 12 December 2014). Newsru.com (2014b) ‘Na referendume zhiteli Kryma reshat, voidet li avtonomiya v RF,’ 6 March. Available at: http://newsru.com/world/06mar2014/crimea.html#2 (Accessed: 12 December 2014). Petro, N. N. (2014) ‘West Needs to Decide Which Is More Important: Punishing Russia or Preserving the Territorial Integrity of Ukraine,’ Valdai Discussion Club, 11 March. Available at: http://valdaiclub.com/near_abroad/67320.html (Accessed: 12 December 2014). Poluneev, Y. (2014) ‘Desyat’ shokiv Ukrainy (Part I)’ Ekonomichna pravda, 12 December. Available at: http://www.epravda.com.ua/publications/2014/12/12/512627/view_print/&usg=ALkJrhizeiv1mTxjFgfZ3IW20aP_Wjjirw (Accessed: 15 December 2014). Rada.crimea.ua (2014) ‘Postanovlenie VR ARK, ‘Ob organizatsii i provedenii respublikanskogo (mestnogo) referendum,’ 27 February. Available at: http://www.rada.crimea.ua/act/11610 (Accessed: 12 December 2014). Ru.wikipedia.org (2014a) ‘Novorossiya.’ Available at: https://ru.wikipedia.org/wiki/Новороссия (Accessed: 12 December 2014). Ru.wikipedia.org (2014b) ‘Istoriya Kryma.’ Available at: https://ru.wikipedia.org/wiki/История_Крыма (Accessed: 12 December 2014). Tyazhlov, I. (2014) ‘Na tom i stoyat,’ Dialog.ua, 7 February. Available at: http://dialogs.org.ua/ru/periodic/page32265.html (Accessed: 12 December 2014). Ukrainska pravda (2012) ‘Ukrainska mova vtrachae pozitsii v osviti ta knigovidanni, ale trimaet’sya v kinoprokati,’ 9 November. Available at: http://life.pravda.com.ua/society/2012/11/9/115486/ (Accessed: 12 December 2014). Ukrainska pravda (2014) ‘Yushchenko pro Krym i Donbas: tam chuzhina chizhinoyu,’ 26 December. Available at: http://www.pravda.com.ua/news/2014/12/26/7053324/ (Accessed: 26 December 2014). Zerkalo nedeli (2014a) ‘Mnenie i vzglyady zhitelei Yugo-Vostoka Ukrainy: Aprel’ 2014,’ 18 April. Available at: http://zn.ua/article/print/UKRAINE/mneniya-i-vzglyady-zhiteley-yugo-vostoka-ukrainy-aprel-2014-143598_.html (Accessed: 12 December 2014). Zerkalo nedeli (2014b) ‘Pesnya o rodina. Slova narodnye,’ 27 December. Available at: http://opros2014.zn.ua/main (Accessed: December 2014). Nicolai N. Petro is Professor of Political Science at the University of Rhode Island. He received his PhD in Foreign Affairs from the University of Virginia in 1984. During the collapse of the Soviet Union, he served as special assistant for policy in the US State Department. He is the author or editor of eight books and has written about Russia and Ukraine for many publications, including The American Interest, Asia Times, Christian Science Monitor, The Nation, The National Interest, and The New York Times. In 2013-2014, he was a Fulbright Research Scholar in Ukraine working on his latest book, Blessed Is the Kingdom: The Orthodox Church and the Struggle for the Soul of Modern Russia, which is under contract to Stanford University Press.